During A Wider Brunch 2017, Rabbi Lisa Edwards from Beth Chayim Chadashim in Los Angeles gave an incredible D’var Torah in Arthur’s honor. Yes of course, i thought, if it’s the narrowness that makes us afraid, let’s widen the bridge —not only is it less scary if there’s room to pass when you come face to face with someone going the other way, but let’s make it possible for us to walk across not single file but side by side, arm in arm, maybe even like at the octopus convention: arm in arm in arm in arm in arm in arm…you get the idea. But I’ve also sometimes wondered what Rav Nachman could have meant really, by “do not be afraid.” Ever? Of anything? That’s hardly human. So i was relieved to discover recently that I’m not the only one who questioned this, and one of my colleagues [Rabbi Daniel Pressman] reports that what Rav Nachman actually wrote was: “When a person must cross an exceedingly narrow bridge, the general principle and the essential thing is not to frighten yourself at all.” shelo yit-paheid k’lal. Although it was a frightening event — the shooting at the queer youth center in Tel Aviv in 2009 — that prompted Arthur Slepian to create A Wider Bridge, it was not the event itself, but the people he met when he traveled to Israel shortly thereafter, the people who, like him, refused to frighten themselves out of getting involved, that inspired Arthur to devote the past eight years to an organization dedicated to growing equality in and for Israel. In the Torah portion Jews begin reading this week, Lech-lecha, God calls Avram aka Abraham avinu, the father of the Jewish people, to “Go forth from your native land … to the land that I will show you.” The commentators famously note that the phrasing God uses – Lech-lecha — means not simply “Go forth,” but “go for your own sake.” [Genesis 12:1] Of course what turned out to be for Abraham’s sake also turned out to be for the sake of generations of a people not yet formed when God gave Abraham that first instruction. The same might be said of Arthur Slepian — that his idea to create an organization that sought to build/widen the bridge between queer communities in the U.S. and Israel was for Arthur’s “sake” – giving him something to do after his early career retirement, plus allowing him ample opportunity to travel back and forth between the United States and Israel, the places in the world that meant the most to him. But as with Abraham’s journey, the Wider Bridge Arthur created turned out to be for the sake of many, many people — in the moment and in generations still to come. Arthur, you and A Wider Bridge have done just that — for your own sake and for ours you refused to frighten yourself out of stepping up to a journey whose destination you did not know, to create an organization whose capacity and influence you could not have imagined — and in the process you have made A Wider Bridge and yourself into many blessings — felt by all of us who have been touched in these past seven years by your vision and your steadfast efforts. 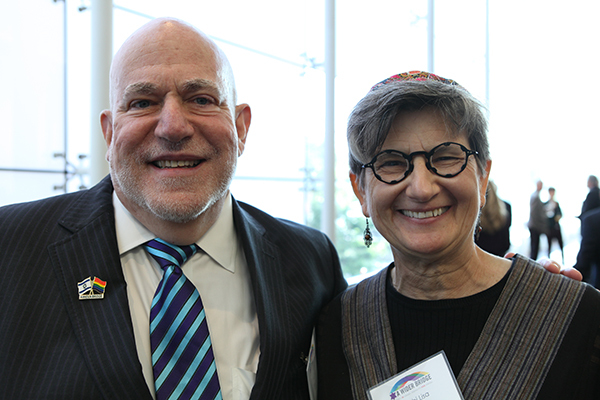 Mazel tov and kol hakavod — all honor to you, Arthur, and to all who have joined you over the years — you leave us in good hands, we know, and we are forever grateful for your bravery, generosity, dedication, and WIDER vision. Gerry — he’s all yours again! Arm in arm – off you go for some much deserved time together. Enjoy!